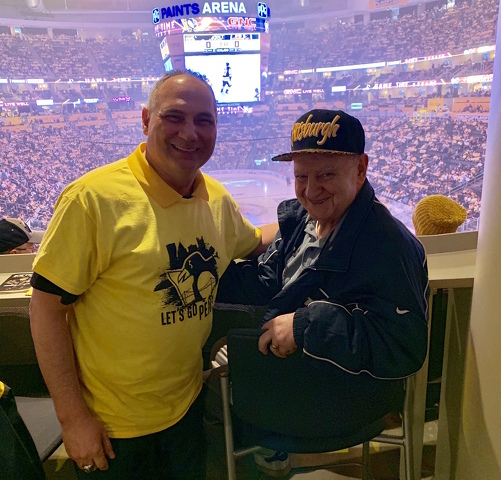 Cheering on the Penguins in a playoff game at PPG Paints Arena was part of a great sports week for Joe Battista. “Hey dad, how would you like to go to the Penguins playoff game with me?” This past Sunday was the end of one of my favorite weeks of the sport season and getting to spend it with my 87-year-old sports-obsessed father was priceless. During that Penguins game I received a text from my son, “TIGER ALMOST GOT A HOLE IN ONE! !” A little while later: “Mission Accomplished” and “The crowd is so LOUD!” as Tiger Woods unexpectedly captured his fifth Masters title. This past week is always one of the best weeks of the sports year for this hockey- and golf- loving sports fan. 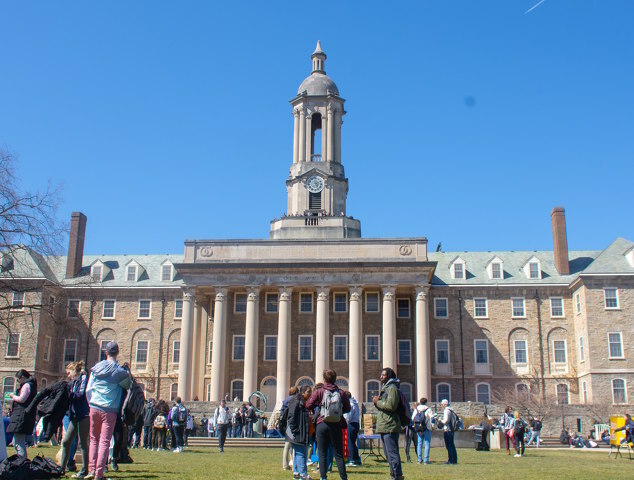 Just coming off the excitement of the men’s and women’s basketball Final Four, we enter the start of the Stanley Cup playoffs, the NCAA Frozen Four, and my personal favorite, golf’s Masters Tournament. Wednesday was the start of the Stanley Cup playoffs and four days of intense playoff hockey ensued, with four games each day— a hockey junkie’s delight for at least four straight days. Right off the bat was a big come-from-behind road upset by the Columbus Blue Jackets over the Tampa Bay Lightning, the NHL’s best team in the regular season. That was only the start as the Blue Jackets beat the Bolts again in Tampa and then in Columbus to take a 3-0 series lead. No one saw that coming! Meanwhile Toronto, St. Louis, Colorado and Vegas have all won at least one game on the road upsetting the higher seed, so the surprises keep on coming. There is nothing like playoff hockey for sheer intensity and drama. Speaking of playoff hockey, Thursday afternoon was the start of the NCAA Frozen Four, as defending National Champion Minnesota-Duluth defeated Providence 4-1 in a semifinal game that featured outstanding goaltending and defense from two closely matched teams. In the second semifinal, No. 1 ranked UMass held off the Denver, 4-3, in OT. It was another hard-fought game that saw Denver erase a two-goal deficit in the third period to force OT. In the national title game, the Minnesota-Duluth Bulldogs proved the old adage that you win championships with great defense and goaltending as they blanked the Minutemen 3-0. Congratulations to Minnesota Duluth and coach Scott Sandelin for their back-to-back national championships and third consecutive Frozen Four! It’s the third national title for Coach Sandelin who has ties to Pennsylvania. Scott played minor league hockey for the Hershey Bears while his wife, Wendy, is a Penn State graduate from the Hershey area. After two solid days of Masters golf, NCAA and NHL playoff hockey we traveled into Pittsburgh for the weekend. We stayed on top of the Masters with live streaming and the PGA Channel on Sirius XM radio. We went to Pittsburgh for three reasons: First was my niece Shannon’s baby shower that my wife, daughter and mother would attend; second, because I was giving the keynote address at the Toastmasters district conference at the Marriott Airport Hotel on Saturday; and finally, to attend the Pens game with my father. The Toastmasters conference was terrific. Toastmasters is a great organization for anyone wishing to grow their communication, leadership and public speaking skills. The theme of the conference was “Lead with Words.” I arrived early and enjoyed hearing several of the other speakers, including Chris Daley from TEDx Pittsburgh and nationally renowned speaker Eldonna Lewis Fernandez. Watching the international speech competition and the “Tall Tales” competition was fun, and I learned a lot from watching the seasoned speakers who competed. A big thank you to conference organizers Jeff Kennedy and Denise Etters and speaker liaison Sue Ellis. Based on the number of books I sold, and the feedback I received from the participants, the speech was effective, and the inspirational mission accomplished. Of course, my speech had its share of sports references. 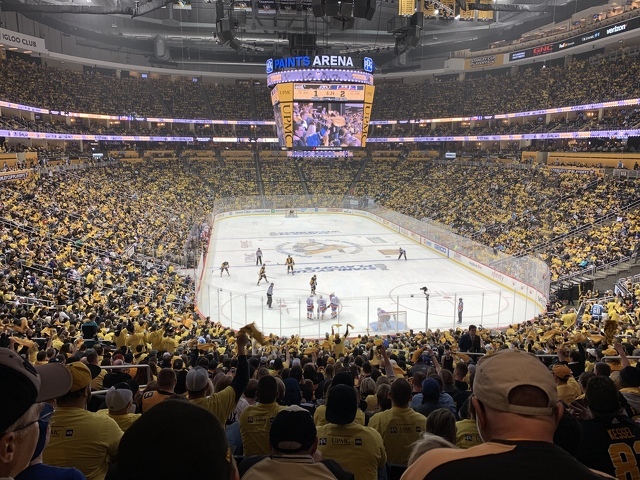 Sunday was “fun day,” as the last round of the Masters was moved up to 9 a.m. due to weather and I was attending the Penguins playoff game with my father. I couldn’t help but think that there aren’t too many more of these opportunities left when we will be able to enjoy, as a father and son, going to sporting events, which we have done our entire lives. There is just something special about being at a live sporting event with my dad, especially when it comes to the playoffs. The Penguins gave away t-shirts and terrible towels and the atmosphere was electric. It is amazing to see how far in-game entertainment has come since my own days in the marketing department of the Penguins in the early 1980s. Redemption, forgiveness, perseverance. While we can’t forget the transgressions of the past when Tiger hit rock bottom with his very public infidelity and divorce, we can be forgiving. Americans love underdogs and comebacks, and this was a comeback for the ages. Two years ago, Tiger could barely walk and was not sure of his quality of life let alone if he would play competitive golf again. His personal troubles have been replaced by a father who is dedicated to his children and a world-class competitor who once dominated his sport. There is a lesson for all of us here and that is to let go of the past and to focus on becoming our best in the future. I have had the honor of attending the Masters twice and can tell you that television simply does not do it justice. It is just a magical place and the staff that take care of the golf course in Augusta National are the best in the business. The Azaleas were in full bloom, the course was immaculate, and barely a leaf was out of place despite weather issues. We actually got a double dose of Augusta National last week when the club held, for the first time ever, the U.S. women’s amateur championships the previous weekend. The club has come a long way in correcting its outdated ways when it didn’t allow women on the course. My favorite week concluded with a Sunday evening encore presentation of the Masters, the San Jose-Vegas hockey game on NBC, and Tiger Woods highlights and interviews on SportsCenter and the Golf Channel. My hockey and golf cups runneth over! One of the most wonderful sports weeks of the year came through, once again. It was even sweeter with a surprising win by Tiger Woods at the Masters. Sharing the week with my father and son makes it all the better.